Zara Lawler has a Master’s from Juilliard and has had several years of Suzuki training (through Book 4 in 2017). She is on the faculty of Manhattan School of Music Precollege Division, and teaches from her private studio near W155 Street. Her natural rapport with children and young people, great sense of humor, and ability to condense music down to manageable chunks make her a wonderful teacher. As a performer, she is known for her adventurous solo program combining music with dance and theater (“The Flute on its Feet”) and her critically acclaimed duo with marimba, Lawler + Fadoul. 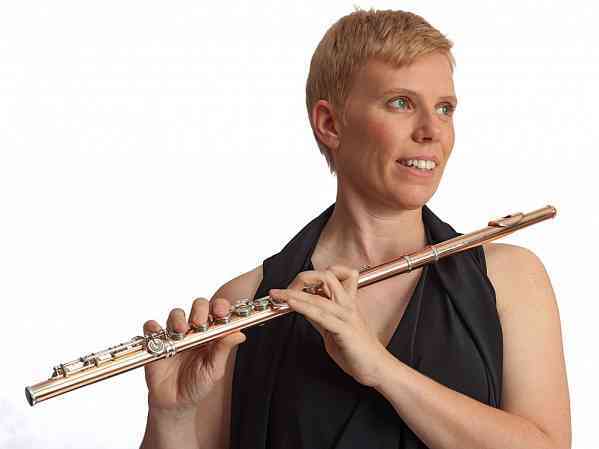 She is also known for massed events for up to 100 flutists, including a performance at the Guggenheim Museum in 2012 which brought together the entire flute community: world famous soloists, New York freelance performers, adult amateurs and students ages 7 and up. I feel amazingly lucky to have found Zara as a flute teacher for my son. She has a real gift for combining rigor and fun, and is both “cool” and professional—a magic combination for students (and their parents). In the 5 years my son has been taking individual and group lessons (since age 6), his enthusiasm has never waned, and his progress has been a constant delight to witness. Also notable is that Zara so deftly weaves music theory into lessons that the students don’t realize what is happening. The ability to sight-read seems to materialize from thin air – not a single moan or groan.